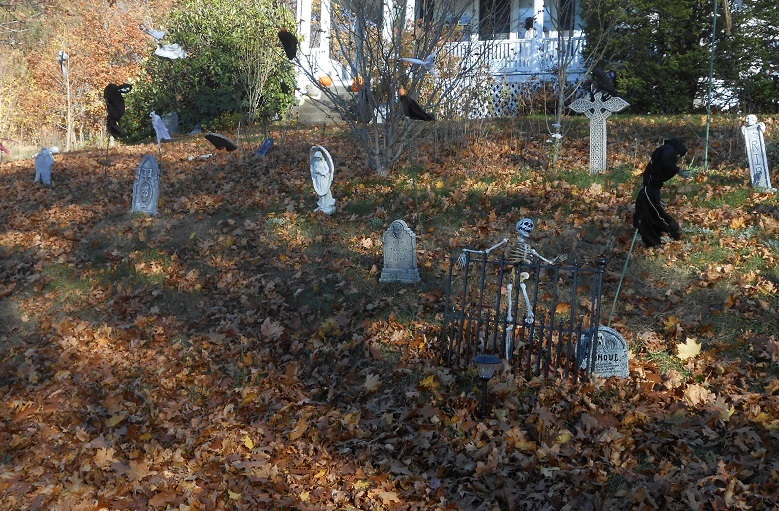 I just got all the tombstones and a few haunting creatures up in my front yard. I still have to add several more supernatural visitors, but the eerie atmosphere is starting to coalesce. Just to give you an idea of what things will look like, I’ll share with you some images from last year’s outside decorations. Here’s a vertical shot of the graveyard in the front lawn. Yang joined in the fun by getting the iron fencing and putting it up for me. Mr. Bones there seems to be chuckling over something the ghoul in black just told him. Did they see into the future for this year’s election? 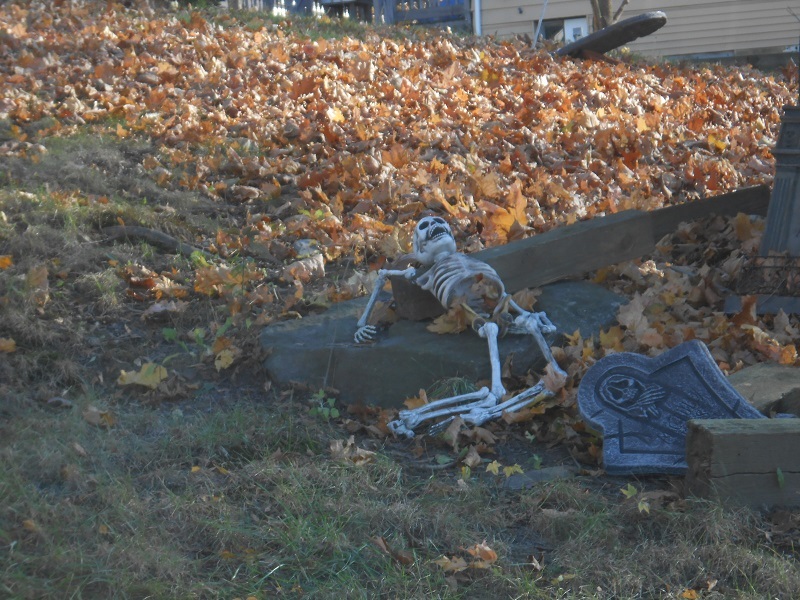 I think this chap is recovering from one of the Halloween parties that I have every year. Either that or he’s someone I caught plagiarizing. See any red marks on him? 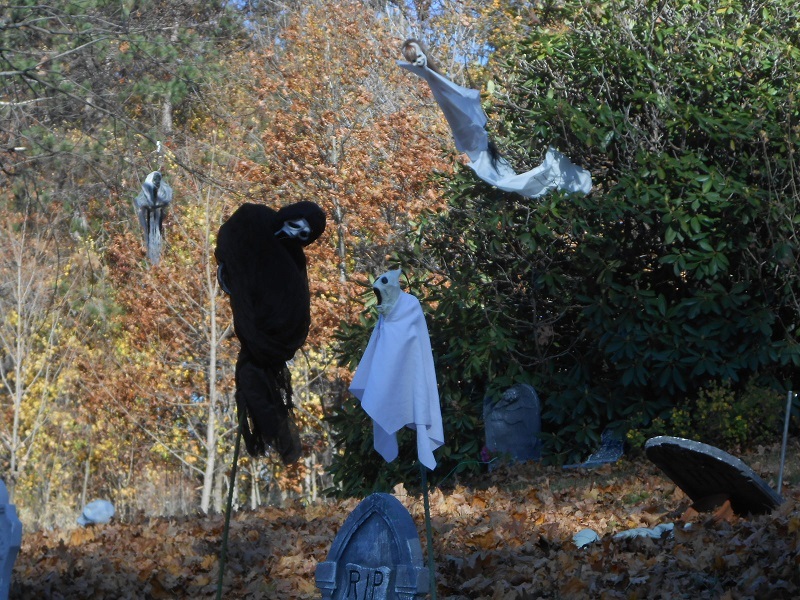 We also were visited by a few witches, ghouls, and demons, flying joyously on the fall winds. Some of them are looking right at you, and they seem awfully glad to see you – for what reason, I’m not sure. it’s probably not good for you! Back to those pesky skeletons again! They’re worse than ants in the summer – and just as hungry. Heh, heh, heh! 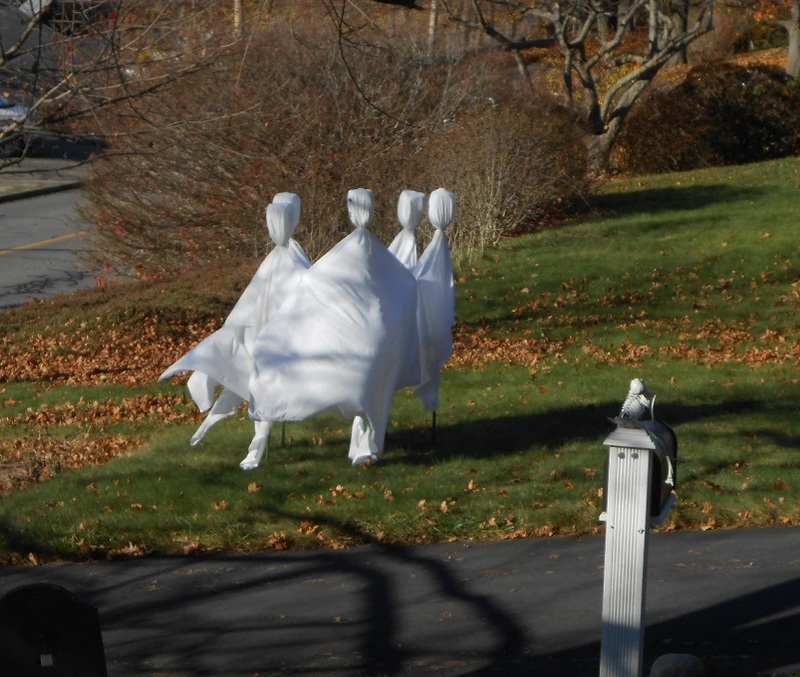 And lest I forget, Here are some shots of our homemade dancing ghosts! 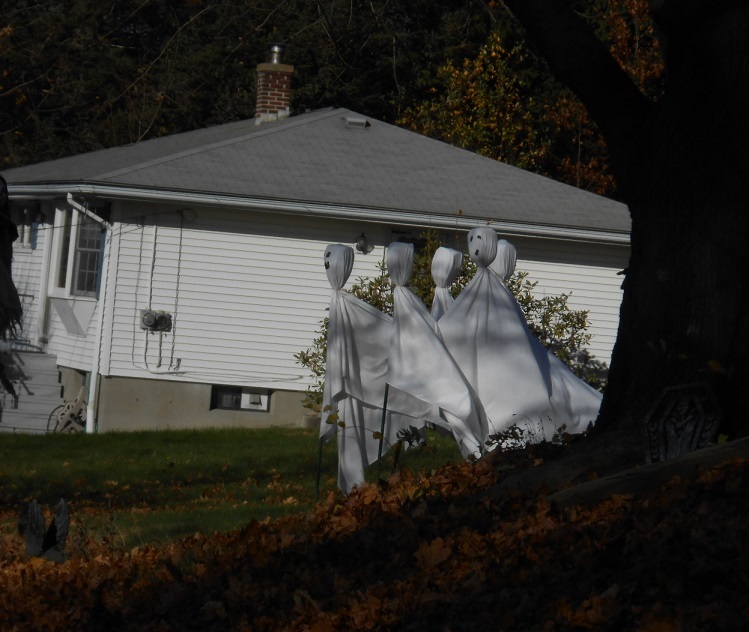 These guys (or gals) usually go up closer to Halloween because if there’s too much rain and wind the ground gets too soft to support them and they become staggering, collapsing ghosts. As Quentin and Beth say, there’s nothing worse than when your ectoplasm starts to sag! 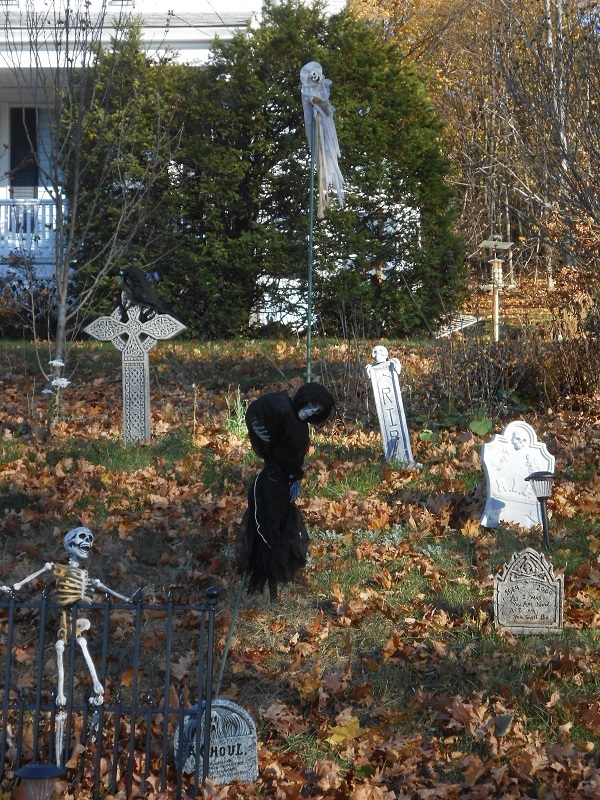 So, I’ll just close with this nice horizontal shot of the whole front yard, to let you drink in the entire spooky panorama. Try not to be too scared as you drive up the street. 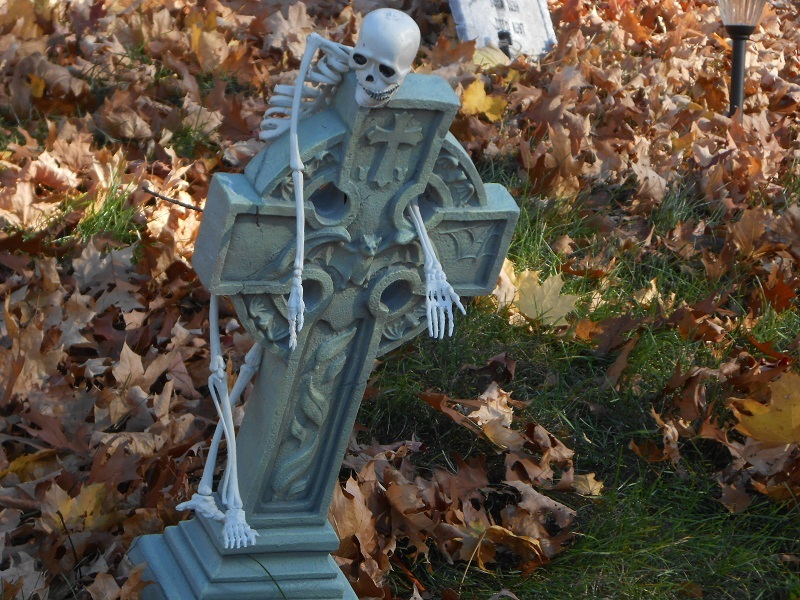 This year, I have even some new tomb stones! It may not be Mt. Auburn or Hope Cemetery, but it’s home sweet creepy home to me! Thank you very much ma’am! It’s hard work and exhausting! But the neighbors seem to get a kick out of it and I enjoy the creativity. How are you doing? I’m doing well…thank you! I would love to do our yard up like that…but my street, Groton Rd., is also known as Rte 225 off of 2A. It may cause an accident. Its a winding road. We will be smudging later today if dad takes Abby out for a while. No joke…this is true.